Cellucor C4 Pre Workout Guide – Which C4 do you pick? Cellucor C4 is easily the most popular pre-workout supplement on the planet. Every supplement store and grocery retailer stocks it: GNC, Walmart, Costco… Bottom line, you can find it everywhere! But what you should know, is that there are now 10 different C4 pre-workouts. Starting just a few years ago, Cellucor began customizing their C4 line with versions made to meet the needs of specific goals. Well, at least that is how they are marketed. Below we’re going to rate and explain each one from 1 to 10, so you can enjoy your workouts that much more. Quick question: what is Cellucor C4? 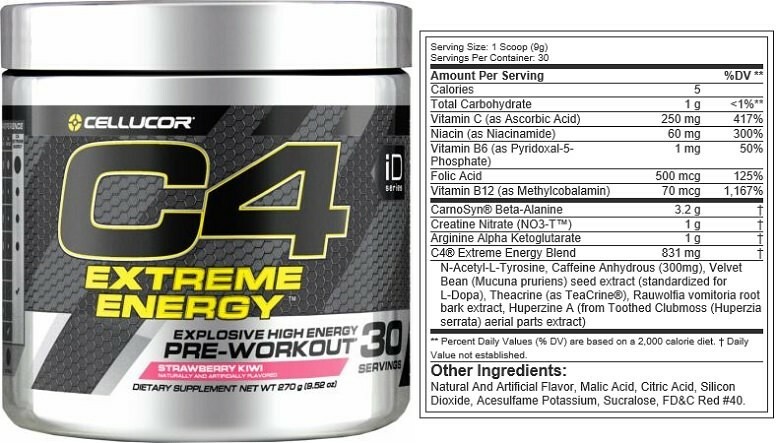 C4 also known as C4 extreme is the flagship pre workout made by the brand Cellucor. Like all pre workouts, C4 is meant to increase your energy levels before you workout, leading to more effective training sessions. 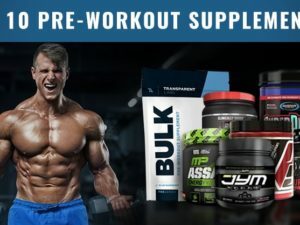 If you are new to pre-workout supplements, we recommend catching up on our beginners guide to what pre workouts do here. There are a total of 10 variations. We have them ranked for you below. Which C4 Pre Workout Is Best? 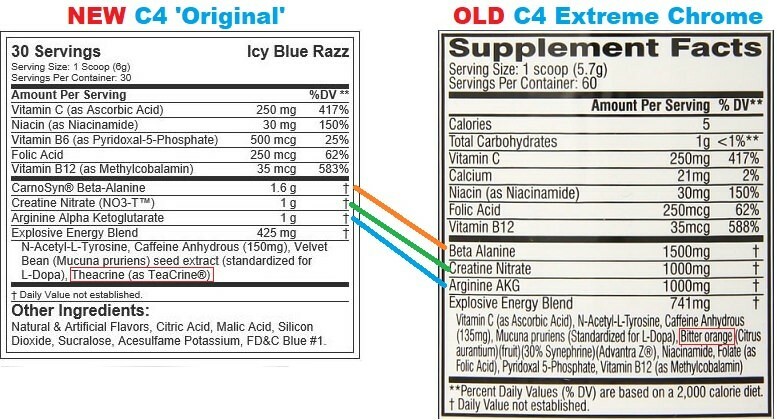 The original C4 is our favorite variation and top C4 recommendation for most people. Why? Because it’s the most cost effective option. C4 Original remains true to the old C4 Extreme in that it is an effective feel-good energy enhancer. While you won’t find synephrine in it, you will find theacrine which proves to be nearly as good. Pair this with a low price-point, and that’s all you need. First off, this bottled C4 Original is not the same formula as C4 Original or C4 Sport. Instead, it contains more caffeine (200 mg), citrulline malate instead of arginine AKG, and betaine instead of creatine. Apparently it tastes good, but you are paying like $2.50 per drink for next to nothing, which is CRAZY! #2 C4 Ultimate: Huge Dosages for the dedicated (and rich). 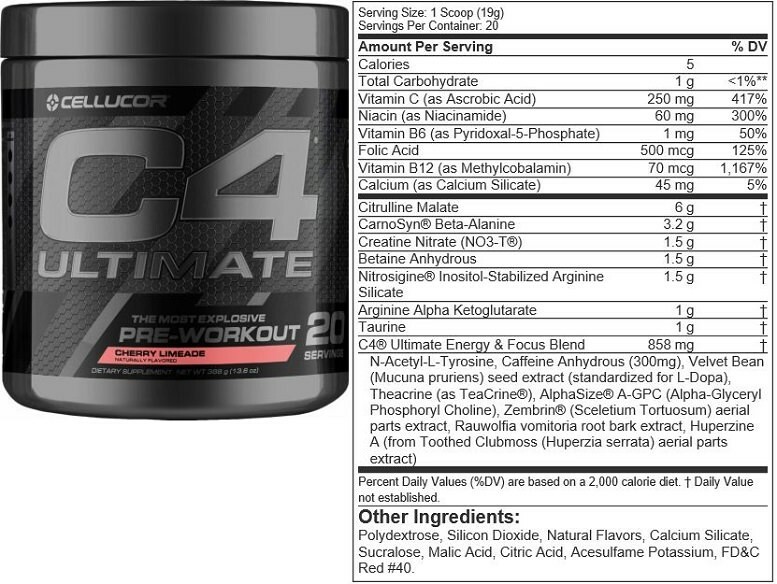 C4 Ultimate has an impressive list of ingredients, in dosages that that standard C4 variations lack. Six grams of l-citrulline malate, 3.2 grams of beta-alanine… Its awesome! The only problem is the straight shot to the skull of 300 mg caffeine without anything in there to smooth it over… For us, that made the intense experience a little too unforgiving, allowing C4 Original to be a definite winner by comparison. Despite the raw stims, you really do get everything in C4 Ultimate. The only ingredients left out are BCAAs for endurance and L-theanine to curb that caffeine! Value alert – C4 Ultimate isn’t cheap, and $40 will only get you 20 servings. Due to this, there are much better pre workouts on the market if big-scoop clinical dosages are your thing (ie Transparent Labs, Legion Athletics, and JYM). #3 C4 Neuro: Better Experience, but you pay extra for it. We liked C4 Neuro a lot, as we covered in our C4 Neuro review where we compared it directly to C4 Original. The only downside to Neuro, is that is an extra $10 per bottle. That wasn’t fun. Truth be told, a lot of the ingredients in C4 Original and C4 Neuro are identical. But, in C4 Neuro, there was added value through many of the ingredients that are now included in C4 ultimate and C4 Ultimate Shreds. In a nutshell, this is added fat burners/nootropics and upgraded choline. Note: C4 Neuro keeps appearing and disappearing off shelves. It may be no more, time will tell. #4 C4 Extreme Energy: All the stimulants in Ultimate. Extreme Energy is basically C4 Original with the stimulant blend from C4 Ultimate. And when we say basically, we mean, that’s exactly the case. Also, this version costs $10 more per bottle than standard C4 Original. If you’re a stimulant junkie, then you may like this version more than the standard. Worthy Mention: This version will hit harder than C4 Ultimate since there are less other ingredients to water down the caffeine. #5 C4 Ripped: Some ‘fat burning’ ingredients at the expense of theacrine. C4 Ripped is the cutting and fat loss version of the C4 pre workout line. 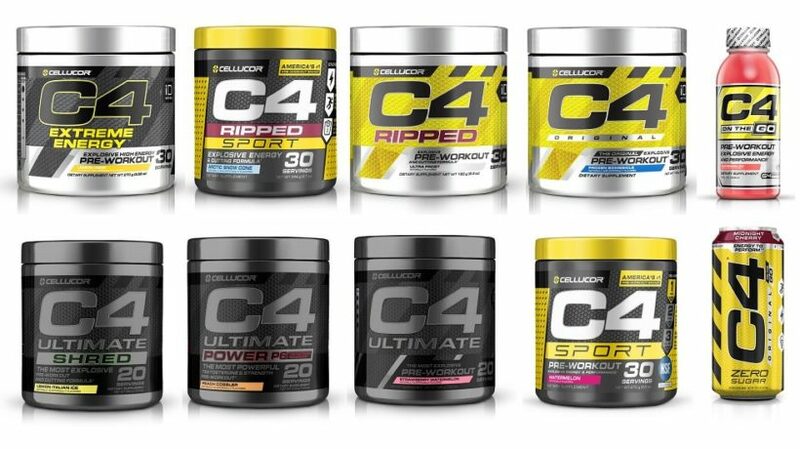 Cellucor claims that C4 Ripped increases the body’s ability to burn fat, while improving performance. While this pre workout does have added ingredients for fat metabolism, we didn’t quite consider them to be enough (total fat burning formula maxing out at only 1 gram. How does C4 Ripped Compare to Original C4? For the new C4 Ripped, the fat burning matrix was added which totals one gram and contains: L-carnitine Tartrate, green coffee bean extract, Capsimax Cayenne, and forskolin. However, ingredients were also removed including: Teacrine, Creatine Nitrate, and Arginine Alpha Ketoglutarate. This means there is a potential for less energy, power, and pump; but possibly more fat loss. You can pay an extra $10 for this ‘special’ edition. C4 Sport isn’t really meant to be taken before sporting events. Instead, C4 Sport is the cheaper version of C4 Original. This less expensive version was initially made for bargain stores like Walmart and Costco, however has now spread to even Bodybuilding.com. Besides a $30 vs $20 price difference, C4 original doesn’t have theacrine, creatine nitrate, or macuna. Basically, they took out the most expensive ingredients and filled the label with non-essential ingredients hoping you don’t notice. The interesting thing, is how little these ‘other ingredients’ actually matter, in both formulas, when you test out both back-and-forth. Just like C4 Original compared to C4 Sport – This is the cheapened version of C4 Ripped intended for bargain stores. That’s why its about $17 less expensive. 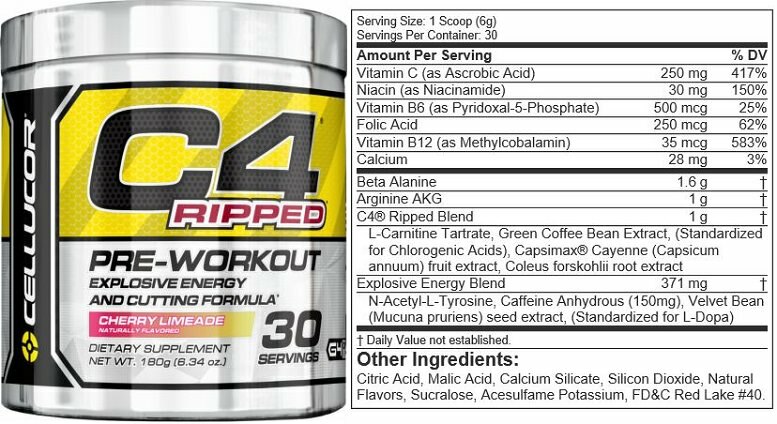 C4 ripped does not contain NALT (n-acetyl-l-tyrosine), velvet bean, or green coffee bean extract. There is also less caffeine per serving, and we expect other ingredients are undercut. Yes, Cellucor has combined their P6 testosterone booster with C4 Ultimate to create: Ultimate Power P6. But it is not as simple as 1+1=2. Instead there are differences between this version and the standard Ultimate. The creatine nitrate was cut to 1 gram, and 2 grams of creatine HCL added. Nitrosigine and Arginine AKG are cut from the team. A 1.325 g P6 Test Boost blend was added. All this can be yours for about $60 per 20 servings… RIP. And that’s it! C4 Ultimate Shreds will cost you about $50 compared to the regular C4 Ultimate at $40. Remember, our top choice, C4 original is only $30 for 30 servings (10 more servings than ultimate). #10 C4 Mass: Most expensive carbs, ever. 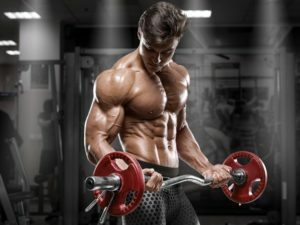 C4 Mass was developed for the majority of men who take their products… Guys who want to build serious muscle and bulk up. To make this happen, Cellucor took their original C4 formula, and beefed it up with a creatine and carbohydrate mix. This mix, leads to better pump, and creatine uptake into the muscles. How Does C4 Mass Compare To Original C4? 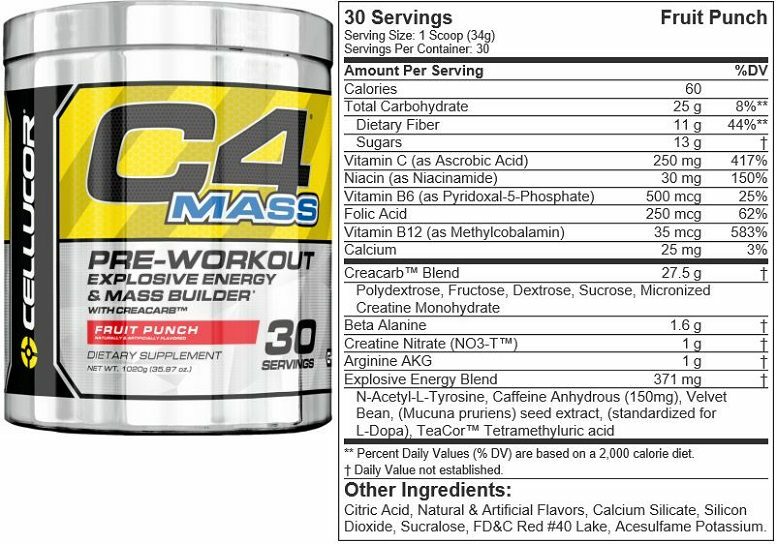 C4 Mass pre workout is the exact same as the original formula, except a creatine-carbohydrate matrix has been added. This matrix totals 27.5 grams and contains Polydextrose, Fructose, Dextrose, Sucrose, and Micronized Creatine Monohydrate. If you were taking C4 Extreme multiple years ago, then you were likely taking a different formula than what is available now. Up until about 2016, C4 contained the ingredient synephrine. This is an ephedra-like stimulant that pairs well with caffeine to offer a great energy experience. However, due to regulatory risk… GNC banned the ingredient, which caused Cellucor to remove synephrine from C4 so that they could continue being a center-shelf in GNC stores. How do the new C4 pre workouts compare? The main difference that you’ll feel when taking Cellucor’s C4 today, versus C4 extreme of yesterday – is that the energy isn’t as crisp, clean, and long lasting. Don’t get us wrong though, it’s still awesome! Though its not entirely that simple. Since synephrine was removed from C4, multiple reformulations and variations of C4 have been made… And they just haven’t been the same. As you can see, there are several differences and similarities between all of the C4 pre workout versions. Unless you don’t mind paying more, the C4 Original is king. From there, you can pay extra for additional perks. However, we don’t really feel like those extra perks are coming at a reasonable price. 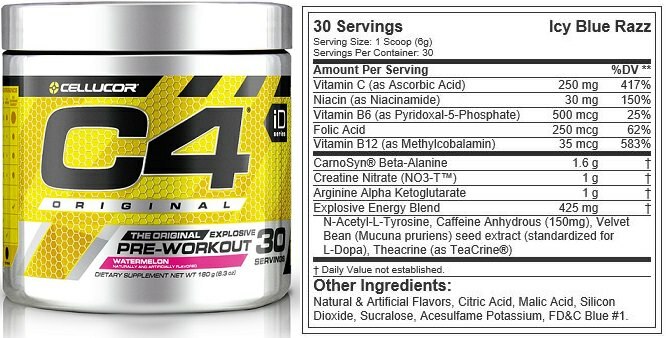 Curious to see how C4 Ranks overall compared to other pre workouts? Here is BWSB’s Top 10 Pre Workout Supplements, based on actual user reviews. Don’t be fooled by other websites and stores best sellers lists which indicate sales performance, not product quality! What about NO3 Ultimate and Chrome? NO3 Ultimate and NO3 Chrome are stimulant free pump agents that are meant to be stacked with pre workouts like C4. You can learn more about Cellucor NO3 here. CN3 is a creatine tri-blend consisting of creatine monohydrate, nitrate, and HCL. Its $30 per 50 servings, but this doesn’t use the gold standard Creapure Creatine.